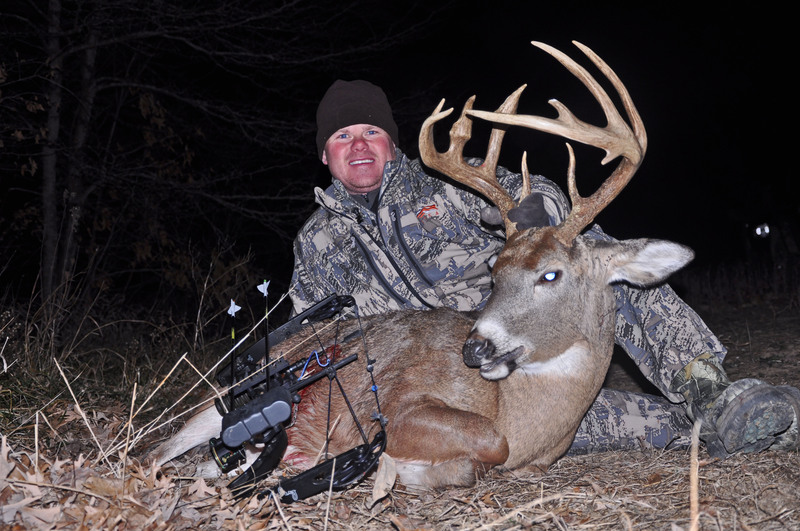 Joe and I headed out to one of my IA leases tonight to see if we couldnt get one down before 1st gun season hits here this weekend…..despite the cold weather and snow flurries, overall movement was slow tonight, but we caught this guy coming out to the beans right before dark….couldnt of happened any better and Joe made a GREAT shot at 47yards! Congrats buddy! Wind burnt cheeks, numb fingers, and a big buck to warm you back up. Congrats Joe, can’t wait to hear the story. I also want to thank the HB crew for making the best bowhunting show on television. I am new to bow hunting this year, and I just discovered the show this fall. My 12 year-old son and I Tivo’d every episode. The photography, editing, and soundtrack really set the show apart. The show really is the next best thing to being in the woods. Please keep up the good work.